Gorgeous! I love everything that reminds me of galaxies. They’re so mystical. Loooove. 2 weeks and black lita will be mine!!! These are insane…I wouldn’t necessarily wear them myself, but I’d love to see them on you! WOOOW THEY ARE GORGEOUS!!!! 🙂 I have to have them. 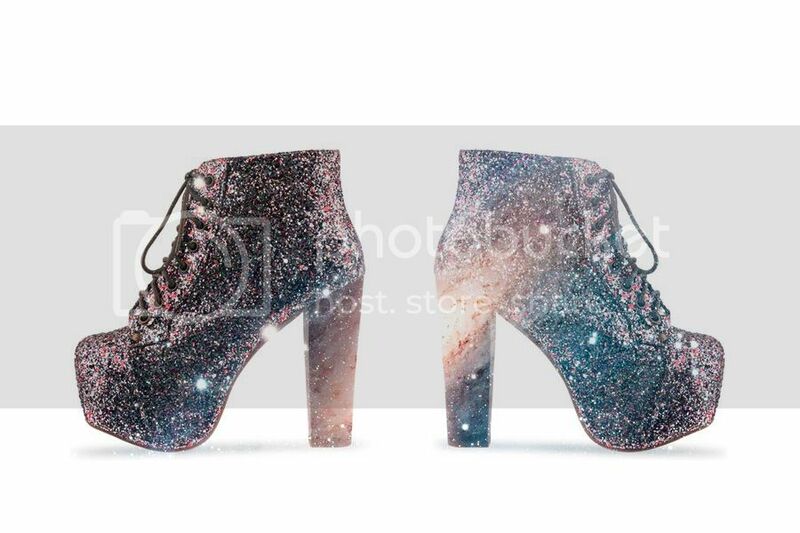 I’ve never liked those shoes… but this spaced out version I could really go for! yeah i think you should get them !!! i would wear this with some red AA disco pants and a rock tee kinda simulating david bowie!!! The Lita’s are too gorgeous! I want them in every color! I can totally see that outfit you have planned up. I def like these better than the silver sparkle lita’s. But no can do, the taupe suede ones haven’t even reached my doorstep yet 😉 ..
WOWWWW! Sparkly! Lol. They’re gorgeous! They’re amazeballs – and I love your imaginary outfit to go with them! i really think they should do something to the heel color/material. I love these in Sparkly, but the heel’s color is a turn off! more glitter to the heel mr campbell, and these Litas will be mine!!!!! OH MY GOSH! Those shoes are beyond!!! I think you will look gorgeous in them. Oh my god, these are so cool! WANT! I think they’d look awesome with my new leather skirt and an extra-long black cardigan. these shoes are so completely badass. Carolina’s lucky to have gotten her hands on a pair! You’re imaginary outfit sounds so interesting! I want you to get them so I can see your outfit come to life!! LOVE your new layout. esp. the header. simply stunning. and oh you would totally rock those shoes. ohh gosh!! i wanna this!! galactic hippie sounds soo good! OMG! I want these soooooooo bad!!! Get Out! These are ridiculously amazing! Love! I love the Litas I just wish I could find a pair! I swear every single pair is gorgeous & sold out.